Before handling the sewage damage; our technicians first access the cause and extent of damage, decide the repairs needed then embark on handling the work procedures. The chief staffs will be on the lookout where they coordinate the aspects of restoration to make sure everything is in order. In the case of any sewage mess; your professional sewage clean-up experts are just some miles away. Make instant phone calls and we’ll surely be at your service. You can also choose to leave a message with our customer support personal and we will dispatch certified restoration experts to your premises within minutes. Sewage failure brings in a stinky environment; it even goes beyond the bad smell, it represents a hazardous environment that needs immediate professional help. We offer a free estimate & no obligation quote besides the 24/7 sewage backup emergency services. 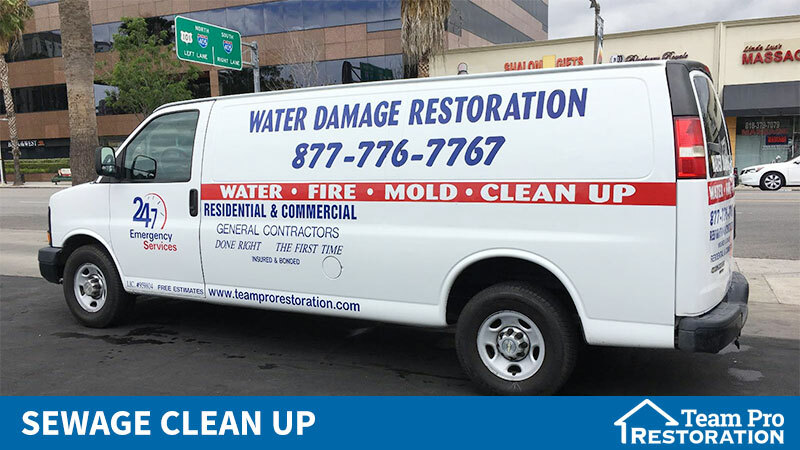 At Team Pro restoration; all the types of sewage repairs are available. We never gamble with your precious property; with us, you are always safe and sure of returning back to your flooded or sewage-damaged home after the expert services.Let us help! If you are in need of any sewage back-up or clean-up service; we have got you covered. Call our experts today and we’ll be glad to be of great help.